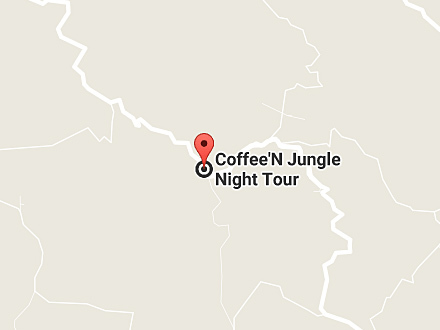 Coffee'N Jungle Night Tour is a perfect blend of coffee tradition and wildlife adventure in Monteverde. On this night tour visitors will learn a lot about the whole coffee process in a very interesting way because it is a dynamic experience that is plenty of fun, not to mention the tasting of one of the best coffees in the world. But Coffee'N Jungle is not just about coffee, it is also about nature. That is why part of the tour is dedicated to exploring the forest as it is an experience very different than that of a daytime. Indeed, at night we can be spectators of the wonderful concert that is performed jointly by several species of frogs and hundreds of insects while witnessing the ephemeral artworks painted by fireflies with light brushes. And with a little luck, we could observe other forest dwellers such as the patient two-toed sloth or the elusive kinkajou. So do not hesitate and make your reservation now. It is in the coffee plantation where visitors have the opportunity to know the coffee plants and depending on the season, the flowers and fruits. Throughout the interesting coffee process, that ranges from baby plant care to the roasting, we reveal simple but important "secrets" that will enable the visitor to choose a good coffee when they return home. Of course, we do not put aside the taste of our great coffee. At this point, we will show our visitors the simplest and easiest way to prepare a delicious cup of coffee. Cocoa has been one of the greatest legacies of our indigenous ancestors, it is the basic component of chocolate which is appreciated throughout the world today because of exquisite taste and important properties. On this tour we show you the most interesting aspects about the chocolate in a delightful way. The mini chocolate tour is an extra bonus, it is the way to thank your visit. The goal at this stage of the tour is the observation of the nocturnal wildlife, which normally can not be seen during the day. It takes place in the protected forest that actually is about 50% of our property and that extends along a creek that runs through the farm where we have the coffee plantation. 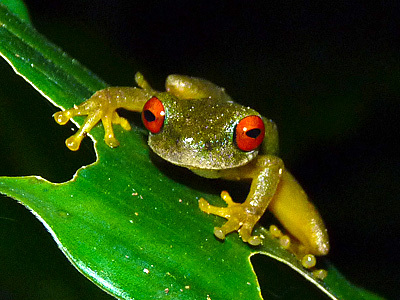 It is common to observe frogs, sloths, various insects and other species. In this gallery you will observe different activities we do on the tour and also part of the fauna that inhabit our forest. The most aromatic, tasty and fresh coffee of Monteverde. Straight from our plantation to your table. Copyright © Coffee'N Jungle Tours 2019. All right reserved.